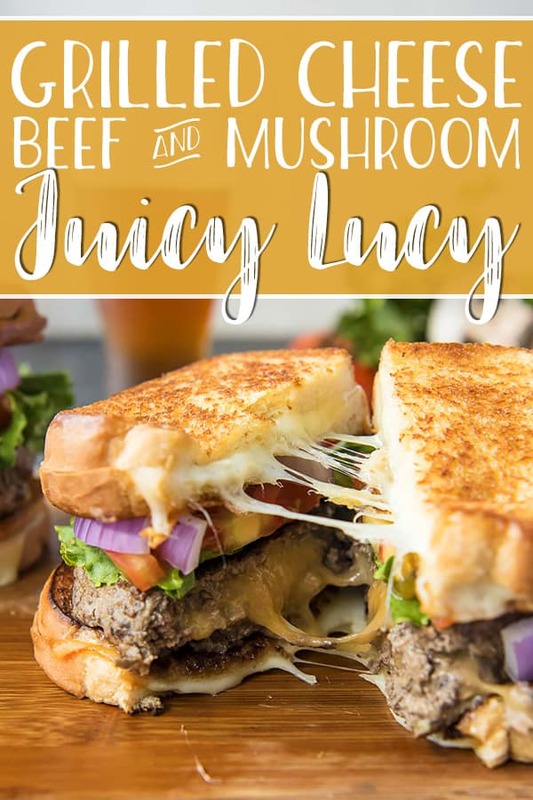 Take your favorite summer meal and elevate it in these Grilled Cheese Beef and Mushroom Juicy Lucy burgers! 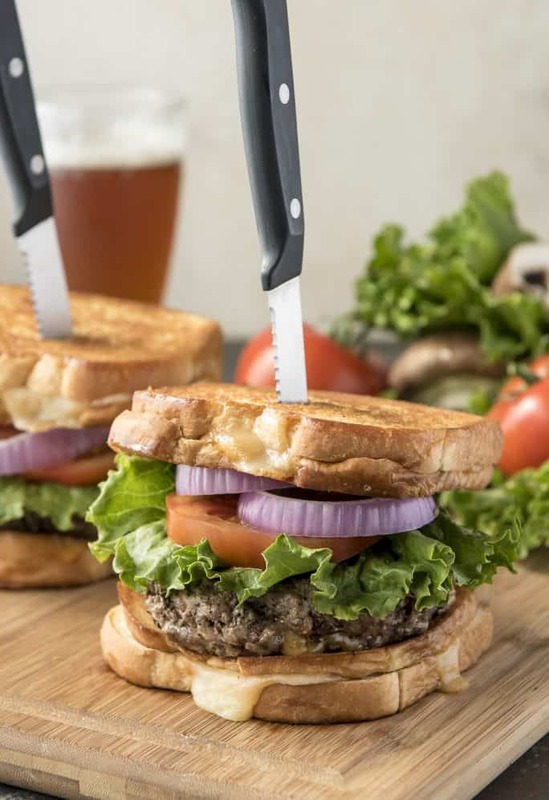 Seasoned, blended ground beef & mushroom patties are sandwiched between two toasty grilled cheese sandwiches instead of buns – making these burgers a cheese lover’s dream! This burger may just be the most indulgent recipe I’ve ever shared. For that matter, it might be the most indulgent thing I’ve ever eaten, and that’s saying something. Have you ever tried a Juicy Lucy burger? They’re apparently all the rage in Minneapolis (where they were created), and now that I’ve had one I know why. Melting cheese on top of a burger is one thing, but for the juiciest, meltiest patty ever – hiding it inside is the way to go. As for the buns, well. They’re buttery grilled cheese sandwiches…and I’m not ashamed of it. 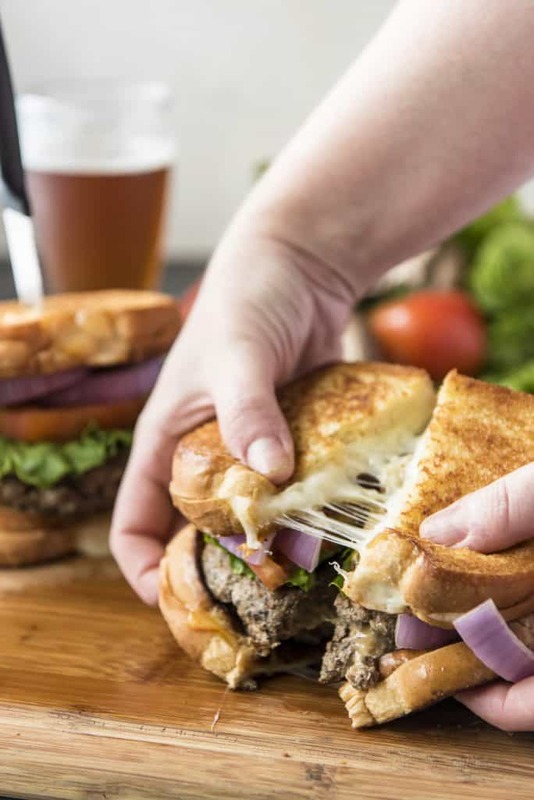 This Juicy Lucy Grilled Cheese Burger may be your new favorite summer dinner! 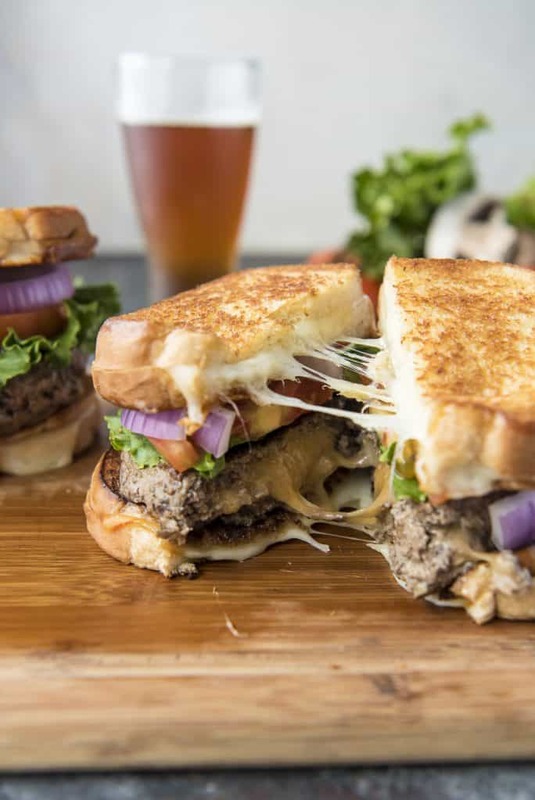 So these grilled cheese burgers take a bit of extra time and attention to come together. If you really want the ultimate gooey cheese experience, you have to time your patty and sandwich cooking well. For me, since I had to photograph these, the easiest way was to keep the cooked burgers under a tent of foil. This kept them warm and juicy while I got the sandwiches made and the shot set up. Of course, if you’re just eating them you won’t need such strategy. What would be even better is tackling these with two people. Have one person man the burgers on the grill, while the other makes perfect grilled cheese on the stovetop. Make sure all your toppings are prepped and you’ll be good to go in no time! As I said, this Juicy Lucy burger is pretty indulgent. I mean – all that cheese, butter, and ground beef with a relatively high fat content (aim for 15-20% for the juiciest!) is what makes this burger shine. The good news is you can actually lighten it up a bit and add a ton of nutrition to it – by simply adding mushrooms. This year, I’ve taken the Blenditarian Pledge and have been loving every bite! After spending a good 3/4 of my life not liking mushrooms, when I finally discovered how good they can be, I never looked back. 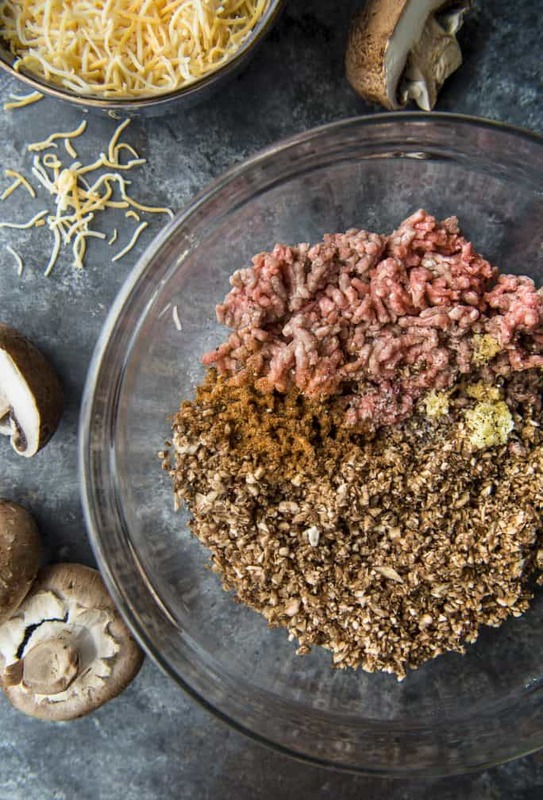 These blended Beef & Mushroom Burgers are my new favorite! The Blend is nutritious. Mushrooms are fat-free, cholesterol free, and low in calories. They also provide important nutrients like vitamins B & D, antioxidants and potassium – things not found in ground beef. Basically, blending mushrooms with your beef is adding an easy serving of veggies to your meal. Don’t tell your kids! The Blend is delicious. So we can all agree that burgers are amazing. Trust me – once you blend some finely chopped mushrooms with your meat, the double umami flavors will steal your heart and tastebuds. No wonder vegetarians love to eat them in place of meat! The Blend is economical. My hubby and I only cook for two, but if you’ve got a huge family to cook for, The Blend is a huge money saver! Adding mushrooms to meat adds bulk and volume, generating more servings and stretching recipes into more portions. Meaning you can feed an army for a fraction of the cost! All these things, and The Blend is also sustainable. One of the most renewable crops on earth, a million pounds of mushrooms can grow in just an acre. They require minimal water and are ready to harvest in just a matter of days! I’m excited to see Blenditarianism taking off around the country! When I was in San Francisco earlier this year, I had one of the best burgers of my life. And yes – it was blended! I’ve also seen some local and even fast food restaurants adopting the practice. It’s so good to see businesses taking steps towards sustainability in such an inexpensive way! Make the pledge to be a Blenditarian and share what drives you to do better! How do you make Juicy Lucy burgers at home? 2. Divide the mixture into equally sized portions. Form 5-inch wide patties from each portion, each one about the same dimensions as a slice of bread. 3. Place some shredded cheese in the center of a patty, then top it with a second patty. Tightly pinch the edges together to seal the cheese within the meat. Cup each patty with your hands to round out the edges and flatten it into a thick patty. 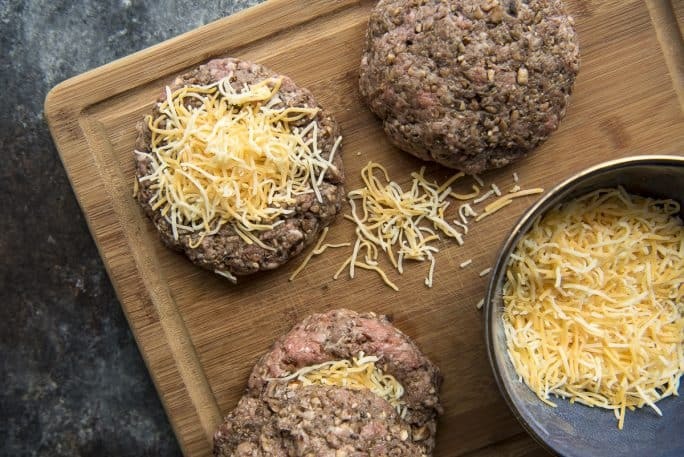 Repeat with the remaining cheese and patties, then refrigerate for at least 30 minutes. 4. Season the outsides to taste with salt before cooking the burgers, 3-4 minutes on each side, to desired doneness. Resist the urge to press on the burgers if they puff up while cooking. Instead, use a fork to poke the beef and release the steam caused by the melting cheese. 5. Leave the burgers to rest on a paper towel-lined plate for at least 5 minutes before serving. This allows the juices to redistribute into the meat. It also keeps you from scorching your mouth on molten lava cheese. • Butter your bread. Don’t just melt butter in the skillet and add a dry sandwich! Butter one side of each slice of bread, then place your cheese in the center of the dry sides. The butter begins to soak into the bread before it’s fried, infusing it with flavor as it melts on the skillet. • Use a great melty cheese. American cheese is standard, but if you’re a cheese snob like I am, go fancier! 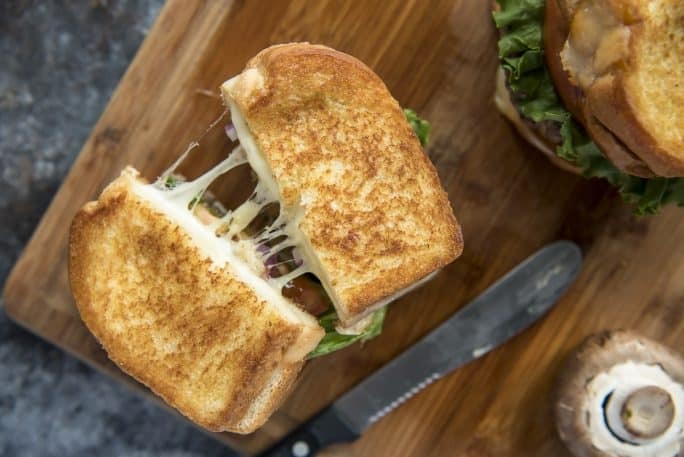 Cheddar is delicious on its own, but try pairing it up with Muenster, Mozzarella, or Havarti for the ultimate cheese pull! • And as for the cheese pull, shredded cheese gets you the most bang for your buck! I usually use sliced, but for dinner table fun, toss the slices in your food processor and pile them in. • Cook them low and slow. I have a bad habit of being in a hurry when I make grilled cheese. This often leaves me with extra toasty toast. Know your stovetop – keep the burner on low or medium-low until you get a feel for the temperature and time needed for that perfect golden brown. Love mushrooms? Try these other recipes using your favorite fungi! 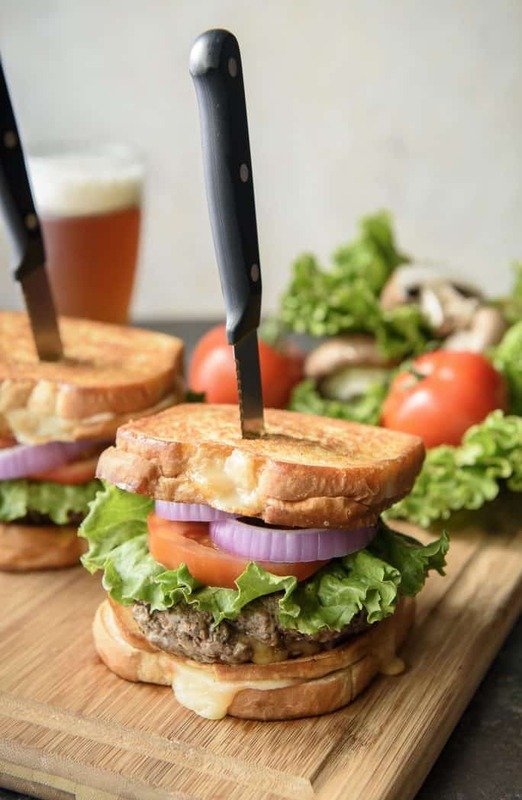 Take your favorite summer meal and elevate it in these Grilled Cheese Beef and Mushroom Juicy Lucy burgers! 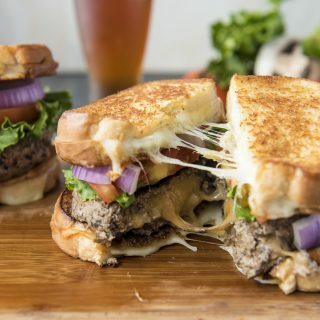 Seasoned, blended ground beef & mushroom patties are sandwiched between two toasty grilled cheese sandwiches instead of buns - making these burgers a cheese lover's dream! 12 slices cheese American, cheddar, or Muenster - something melty! Divide the mixture into 6 equally sized portions. Form 5-inch wide patties from each portion, each one about the same dimensions as a slice of bread. Place 1/3 of the shredded cheese in the center of a patty, then top it with a second patty. Tightly pinch the edges together to seal the cheese within the meat. Cup each patty with your hands to round out the edges, and press on the top with your palm to flatten it into a single thick patty. Transfer to a plate. Repeat with the remaining cheese and patties. Refrigerate for at least 30 minutes. While the burgers chill, cook your grilled cheese "buns". Preheat a large nonstick skillet over medium-low heat. Spread butter onto one side of each slice of bread. Place a slice of bread, buttered side down, on the skillet, then top with a slice (or two!) of cheese. Top with a second slice of bread, butter side-up. Working in batches, cook each sandwich, flipping once, until the bread is golden brown (not burned!) on each side and the cheese is just starting melt. Transfer finished sandwiches to a plate and wipe the skillet clean. Remove the burgers from the refrigerator and season the outsides to taste with salt. Cook burgers until well browned, about 3-4 minutes on each side, to desired doneness. Do not press on the burgers as they cook if they puff up - use a fork to poke the beef and release the steam caused by the melting cheese. When the burgers are done, let them rest on a paper towel-lined plate for at least 5 minutes before serving. 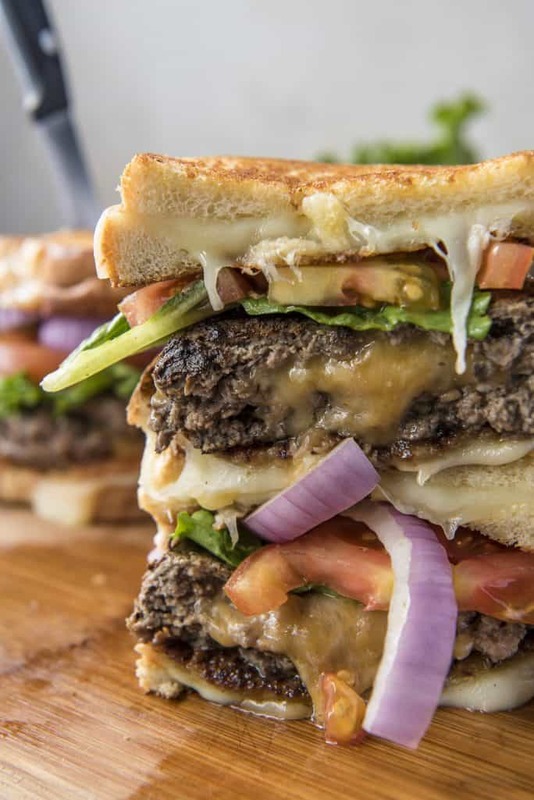 Place each patty on one grilled cheese, top with your favorite toppings, then crown it with another grilled cheese. Keep it all together using a burger knife or skewer. PIN THIS CHEESY BLENDED GRILLED CHEESE BURGER FOR LATER! Looks Delicious, Love your combination. Thanks for sharing it!